It looks that the 2014 budget promises growth at the same time as cutbacks designed to deal with an immediate crisis that doesn't exist. 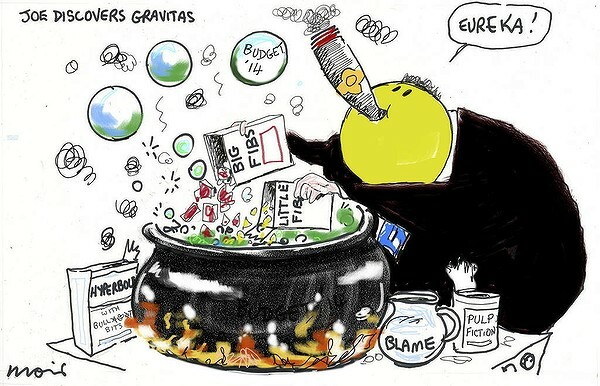 Behind the rhetoric and spin is the neo-liberal politics of austerity with its push for user pays, smaller government that will reduce economic growth and cause economic stagnation in Canberra. The public service job cuts will have negative effect on environmental protection and give Big Mining and fossil fuel industries greater scope for its environmental destruction. That is what smaller government and rolling back green tape means. A neo-liberal mode of governance means no green tape restricting an open for business Australia, irrespective of the environmental consequences. The rhetoric of good economic management in this context means a neo-liberal mode of governance. So Australia sells assets and cuts welfare spending to rein in a debt burden that is already the second-smallest among developed nations whilst refusing to reduce the vast amounts of subsidies and tax credits given to corporations--eg., the diesel fuel subsidy for the mining industry. The cuts in welfare spending for everyday people and disadvantaged people is necessary because these kinds of support create dependency and promotes laziness. In this context “reform” is a synonym for “cut”, and ideology trumps evidence. Austerity is the dominant political paradigm of our time. What's usually meant by austerity is ‘fiscal consolidation’, a term that basically means reducing the budget deficit in order to create the conditions for stable growth, so that growth over time reduces the net debt of the state. Fiscal consolidation is a perfectly sensible thing to do when you are growing and pay back some debt. Austerity is when is when you try and do this in conditions where you don’t have economic growth (as in Europe) or entered a period of low economic growth as in Australia. The LNP's 'contribute and build' rhetoric refers to ‘expansionary fiscal consolidation’. This nonsense on stilts says that we are so worried about government debt that just waiting for the government to slash the welfare budget by 50% so that we can be confident that ten years time that there will be a smaller tax bill as a result of this. So we will go out and spend and invest big time and the big growth rates return. The theory that sits behind this politics of austerity is that of Public Choice, and this attributes the rise in government debt to an inherent tendency of democracies to“live beyond their means." The trajectory of debt management by consolidation is in the direction of a neo-liberal state that is “leaner,” less interventionist, and, in particular, less receptive to popular demands for redistribution than was the case for social democratic states of the postwar period. So we have declining public investment, increasing privatization of government services and increased reliance on private-public partnerships. Will this will restore economic growth and secure democratic legitimacy for the Abbott LNP Government? the Abbott Government's rhetoric to cover over its broken promises is 'contribute and build'. neo-liberalism is asset stripping by the rich who have little commitment to Australia. neo-liberalism is a mode of thinking in which social problems are reduced to individual flaws. We alone become responsible for the problems we confront. It is increasingly the case that critical learning in public schooling has been replaced with mastering test-taking, memorizing facts, and learning how not to question knowledge or authority. It is training students for low-skilled jobs. the new lingua franca of public exchange and "debate" is the growing rhetoric of insult, humiliation, and slander. We live in a time when revenge has become the cure-all for most of our social and economic ills. neoliberal rationality believes in the ability of markets to solve all problems. The market should rule every human activity including the idea that users should pay for every public good from parks and beaches to highways [and] higher education. as the welfare state is being hollowed out to serve the interest of global markets there is an intensification of the practice of disposability in which more and more individuals and groups are now considered excess, consigned to zones of abandonment, surveillance and incarceration. It is generally accepted that there a long term budget problem. This is caused by an ageing population and dwindling revenue and it means that future spending will continue to exceed future revenue unless changes are made. The ‘national interest’ for the LNP means a strong executive implementing austerity to deal with the budget crisis. This requires an ‘emergency budget’ whose overall trajectory is to begin the process of deep cuts and redistribute wealth toward the rich. The budget crisis is first and foremost one of overspending, and demands ‘fiscal consolidation’. Cutting spending will bring down the structural deficit and give businesses confidence in the future state of the economy and thus encourage them to begin investing in growth. In so doing the LNP shows itself to be a good economic manager. As we have recently seen, since businesses are unwilling to tolerate high taxes, and politically powerful enough to resist them, governments can only raise revenue through growth, which isn’t tremendously high, or politically unpopular taxes on consumption. The alternative is to cut spending which, protecting core infrastructural investments and business subsidies, would mean cutting popular services and welfare provisions. The politics of austerity can be seen as partially an attempt to shift the balance of class forces and thus change the definition of what is politically viable. As a policy is also in accord with the interests of the dominant fractions of capital--miners and bankers--- with the policy being framed with reference to policy-relevant academic and think-tank research. For the LNP government is the problem--it is the enemy of profit because of the redistributive demands from the left of centre pressure groups. The Liberal Party's dominant constituency is no longer the people but the corporate world which demands the removal of all brakes from the influence of business on politics. if you accelerate your deficit reduction program, you undermine economic growth. The government argues that we are facing a budget emergency that must be fixed, and that we are all playing our part in making sacrifices that will help get the budget back in the black. Everyone must contribute. However, in reality this is a budget that will impact far more heavily on lower income earners, and welfare recipients, than higher income earners. The latter are let off.